This 52 foot luxury catamaran is the perfect balance of cruising comfort and performance sailing. Using high end composite construction materials and techniques, the Seawind 1600 is for the sailor who is looking for something a little extra. With simple sailing systems, twin protected helms and a large open cockpit space, this blue water luxury cruising catamaran sets the standard for offshore sailing. Comfort and performance are a tradeoff discussed endlessly. The 1600 strikes this balance through the use of advanced build technologies and continuous weight-saving efforts. However, strategically placed carbon fibre reinforcements to the daggerboard case, bow and other areas not only make the 1600 stiff and fast, but also gives her the beachability that so many Seawind catamarans are renown for. Check out this great review by Multihull World, taking their first look at the new Seawind 1600. As seen in the animation below, through the use of retracting daggerboards and rudders, and despite the lack of mini-keels, the 1600 is safe on a sandy shoal. 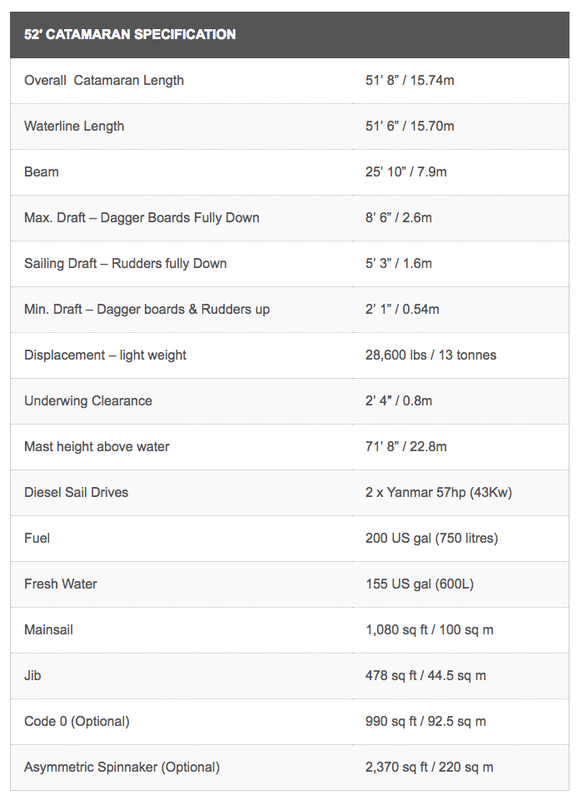 The minimum draft (with daggerboards and rudders up) is only 54cm – or 2ft 1inches. That means the Seawind 1600 can enter many areas typically reserved only for mini-keeled multihulls or daysailers, such as reefs and sandy inlets. Captive daggerboards, which don’t protrude through the deck, reduce maintenance and keep a clean deck that could otherwise prove hazardous offshore. And this approach conveniently maintains the aesthetic of the stunning Reichel Pugh design. The daggerboard lifting mechanism is run to the cockpit, so there’s no need to rush forward and then cross the boat to raise the boards. As Seawind’s flagship performance catamaran, this blue water cruiser offers state of the art equipment and a world class luxury fitout. The 1600 interior will be offered in both “European” and “Traditional” finishes. Her cockpit has plenty of seating and room to move and features an L shaped lounged and dining table under the hardtop, which will offer out door dining for up to 8 people. Her modern and luxurious interior will come in two distinctive styles ‘European’ and ‘Traditional’. Her fully equipped and spacious galley is situated on the port side of the saloon. It has plenty of bench space and storage and the U shape design of the offers some safety when in rough weather. The saloon has an eight person dining table, drop down television and built in surround sound. There is also a separate nav station from which you have 360 degree vision through the windows. The Seawind 1600 will be available in two configurations — four cabins (two in each hull), or three cabins where the entire starboard hull becomes a spacious owner’s suite with an island berth aft and a sizable bathroom with separate toilet and shower forward. The other two bedrooms and a second bathroom/toilet will be housed in the port hull. A Vietnam delivery is becoming more popular! Learn about taking your Seawind 1600 delivery in Vietnam! It's a great process if you have the time. There are some fantastic places to sail around in Asia. If you would like to take delivery in North America or the Caribbean, 180 Marine will work with you. Popular delivery options include Seattle, San Francisco, Los Angeles, Saint Petersburg, Miami and more. If you're interested in knowing more about the Seawind 1600 contact Richard Allen. We will guide you on where best to put your boat into a charter fleet.